Today’s ‘Fix’: Nick Cave & the Bad Seeds from their first American tour in 1984. The video footage is from Perkins Palace, Pasadena, CA, where the band played on June 22, 1984. Low angle camera view enhances the chaotic action. Outstanding piece of Bad Seeds history. LOOK UNDER PAGE CUT for video, setlist, + chronology, trivia, etc. Setlist: A Box For Black Paul, From Her To Eternity, I Put A Spell On You, Mutiny In Heaven, Well Of Misery, Saint Huck, Avalanche, In The Ghetto. Later that night, Henry, Blixa Bargeld, Mick Harvey, and Hugo Race attend The Gun Club concert in Santa Monica where Henry and Blixa end up slow-dancing. 23/24 Jun 1984 In a West Hollywood garage, Evan English & John Hillcoat shoot the “In The Ghetto” promo video with Nick Cave. [Morgan note: this video shoot needs its own post, but for now, I’ve linked to promo included in the remastered deluxe edition of From Her to Eternity (2009)]. 25 Jun 1984 The band play at a private loft in Kansas City. July – Sept 1984 Nick stays in L.A. with Hugo Race, spends time with Henry Rollins, performs a reading at the Lhasa Club, and meets future Bad Seed Kid Congo Powers and Jeffrey Lee Pierce of The Gun Club. Oct 1984 Nick returns to Christoph Dreher’s Dresdener Strasse flat to write songs for ‘Firstborn is Dead’. 23 Nov 1984 The band play Barcelona’s 666 Club. Hugo Race has departed. Nick, along with Blixa Bargeld, Barry Adamson and Mick Harvey, form the final lineup that will record Nick Cave & the Bad Seeds album #2. This entry was posted in 1980s Era, Blixa Bargeld, Einstürzende Neubauten by Morgan Wolfe. Bookmark the permalink. 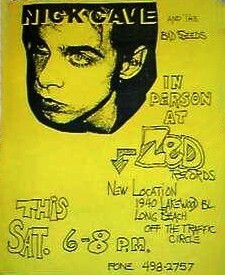 I was at Zed Records for the in store signing in Long Beach. Henry did not drive them and Nick and Blixa both showed. I am new there, posting for the first time but I am a regular reader and this site has become my lifesaver in my recent mad and psycho days. There’s nothing as soothing as a proper dose of Nixa! I admit honestly that I am a hopeless Neubauten addict, it’s been going on for years. 🙂 A blog focused on Blixa has a guaranteed way to success, methinks – there are crowds of people craving for fresh Blixa Fixes. By the way, is there a possibility to share the video again? It’s not available anymore. Hi! Glad to see your post. I am delighted that you have found a haven here. (I can relate to the ‘mad psycho days’ things you mention.) As you can tell, I am a hopeless Neubauten addict as well. Mr. Blixa has everything to do with that little condition. Ah, such sweet suffering, right Halciion? Your encouragement about my plans to start up a Blixa Fixes blog is much appreciated. It helps to get feedback on these projects because they take up a lot of time/energy. I have a lot of Blixa material, it’s just the problem of finding time to set things up. Possibly, it’s best to just open the damn thing and add material as I go along. This place keeps me pretty busy since Nick is a work-a-holic and there is no end to news about him. Plus I have a rather messy personal life at present. Well, dear lady, thank you for posting. Do come back – I sometimes go a few days without posting but will answer you as time allows. Also, I will look into the video problem and re-upload it if necessary.